This is an update to let you know about a major decision I’ve made in my experiment in selling art online. I’ve been reading a lot of books, watching videos, teaching myself new things, and just generally learning as much as I can about what is required to put an online business together. Watch the video to see what I discovered. And be sure to stay tuned for the next video, where Jessie Rasche, (she’s my daughter and an award-winning painter), shows us how to paint fur on our sculptures. You won’t want to miss it, and it should be online soon. There are two books about business that are my current favorites. The first one, Profit First by Mike Michalowicz, is helping me get my head around that idea that a business should pay a fair wage to its employees. And, perhaps even more importantly, that the money you’re paid over and above your materials cost is not profit. There’s no profit until the employee (that would be me) gets paid. Do you agree with that? If not, let me know why in the comments below. The second book is one that I’m currently reading, The One Page Marketing Plan by Allan Dib. I’ve only read a few chapters so far, but he already convinced me that an art business is no different from any other business, even though most artists say it is. Most of us would prefer to not do all the selling and marketing and other business stuff because we want to concentrate on our art. But Dib seems to think that’s normal for small, one-person businesses, and it’s one of the reasons why so many people give up so quickly. If you disagree, tell us why. Thanks for writing this, I couldn’t believe it when I read it and watched the video as I had been coming to the exact same conclusion you have that the amount of work and time that goes into making these sculptures makes it difficult to charge a fair price! I love making the sculptures but especially the larger ones are difficult to sell for a realistic price especially when you factor in shipping charges. I have approached galleries who are happy to stock my sculptures as sale or return but would take 50%…..this does not make it worth my while even picking up my tools! I have been brutally honest with myself and decided to keep my Etsy shop open with remaining stock and list all sold items as made to order so if someone wants one made I can just get on with it. 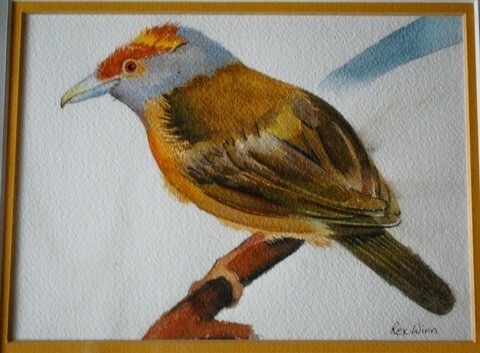 I am going to concentrate on my painting and selling those through galleries. I am in love with carousel horses and am doing a series of large paintings of your fabulous antique american ones! 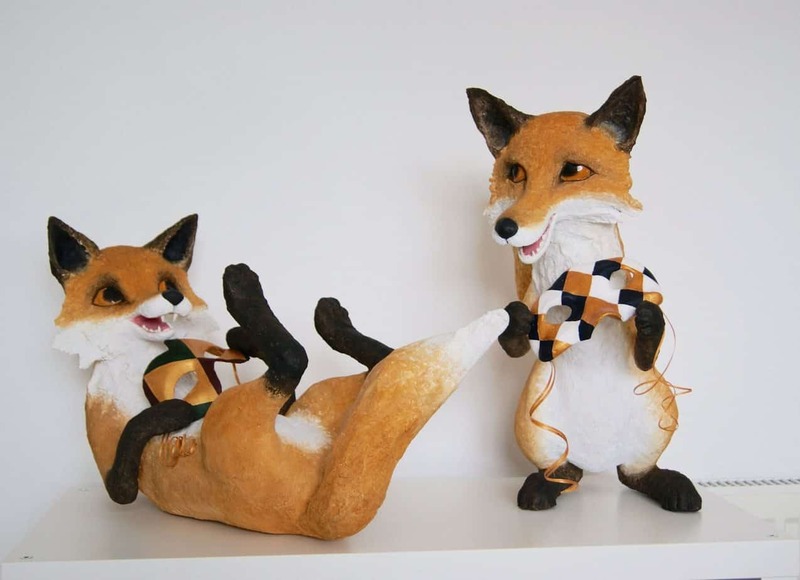 I have donated two large sculptures to animal rescues and my latest two cheeky life size foxes that went to the huntsman ball are in a local gallery window giving me more studio space. This gallery gave me some good advice as I dare not even tell them the cost price of producing these two…they told me I was undervaluing them because of the material they were made from and that in their opinion I should charge £800 each. Their point was that had they been made from ceramic or bronze, people would expect to pay that amount. I was shocked and doubt they will sell and if they don’t I will try approaching some pubs and restaurants called ‘The Fox’ etc (there are plenty in England!). I really hope your business works out, you deserve it. Keep us updated! Here are the two foxes I mentioned so you get an idea what I am talking about! Now I’m curious, Susan. Would you mind telling us the price you put on the sculptures, the one that the gallery said was too low? And do they have any experience with paper mache? You have some very good paper mache sculptors in the UK and Europe, so you might be able to do some market research to see what the other artists are charging. (And maybe find out which galleries they’re showing in). Your foxes are adorable. I love their playfulness, and the idea of two foxes getting ready to go to a masquerade ball. There must be a story that goes with them? And, speaking of stories, have you considered using your sculptures as illustrations for story books? I have no idea how it’s done, but it might be fun. Hi Jonni, thanks for your comments. I was guided by the gallery and let them put the sculptures at £800 each as they were taking a hefty commission! As I say, I doubt they will sell but there is no harm in trying. They don’t have any experience of the medium and I find it hard to explain to people really what it is they are made from as its not even the true paper mache method. Have you seen the work of Melanie Bourlon? she is a fantastic french artist working in this medium and I would love to go and see her work. Its funny you mention the illustrations as when i had finished making them I laughed and asked myself why I had not just done a painting instead! I made them as I am very much against fox hunting, something our present prime minister is considering bringing back. 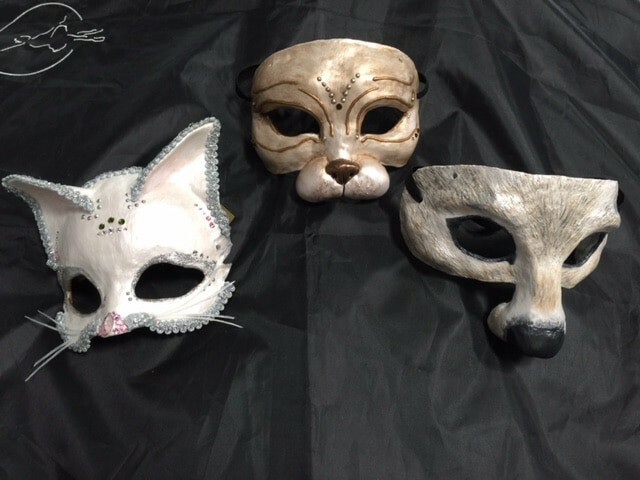 The story is that the foxes sneaked into the huntsmans masquerade ball and are laughing about getting away with it! What a great story to go with your sculpture. Is it written down somewhere in book form? I think it would be great fun to read to kids. And yes, Melanie Bourlon’s work is fantastic. What a talented person. Someone suggested calling our sculptures Mixed Media, which is really ‘in’ right now. No its not written down…yet! I have so many ideas but due to working a different job full time I don’t get the chance to get on with them all! Mixed media is a good description, I will try that and see what happens. I wish you well in your future endeavours and will look forward to seeing more of your fantastic and refreashing artwork. Take care and be well. Hi Aryea. I sure do understand your concern about turning your dolls into a business. I actually did that, years ago. I loved designing my dolls. And I had a great time a few years ago re-designing them to make it easy for other people to make dolls themselves. But turning my house into a doll factory was one of the worst mistakes I’ve ever made. There was no time to design new ones, because there were orders to fill, must keep cranking out the best-sellers, and forget about doing anything else. I wasn’t a designer any more, I was a factory worker. It took all the fun out of it. That standard advice to “follow your passion” only makes sense if your passion doesn’t get lost in the makeover from hobby to business. I think that most of the people who say that are actually selling items that other people make – if your passion is skiing, then you set up a shop selling ski equipment and clothing. Or you design a new, improved ski, and have a factory make them for you. Perhaps that’s something you could do with your doll designs. Keep your enthusiasm for creating the designs, but outsource the factory part of it? I have no idea how one would do that, but it might be worth exploring as a possibility. In any case, keep us posted. It’s always a boost for me to see your work and hear what you have to say. Best of luck with your online plans going forward. I’m glad to know that you want to give this a go. You don’t know until you try and besides, you are very unique in your field. There are fewer of us paper mâché artists in the marketplace but we really do exist! So show ’em what you’ve got and I betcha you’ll have a great following. It can be a bit of a challenge getting started but I know that lots of your viewers will help spread the word for you. Looking forward to hear more. I have admired your work for a while now and really hope you have success with your online business. I am at a similar stage (different product from you) and it is a bit intimidating. I was wondering if you have any nice zoos near you that might be interested in selling your work in their gift shops? I am in the San Diego area and the zoo has tons of tourists throughout the year. Their shops sell a variety of items, including artwork and non of it is cheap. If you don’t have a local zoo, possibly you could try some of the bigger zoos and see if they would be willing to set up a display for you? Just a thought. Good Luck! We do have several zoos, and I got some great photos a few weeks ago when the kids took me to Sioux Falls. And they have a gift shop. But I really have my heart set on learning how to sell online, so the gift shop won’t work well for me. However, it is a great idea, and we have a lot of people who come to this site to show off their animal sculptures. Maybe one of them would like to follow through on your tip. Since they have shops instead of galleries, they might even buy things outright instead of taking things on commission, like galleries do. It would sure be worth checking out. I don’t have a website. I think at first I am going to try Etsy. I have been doing costuming items and headpieces for a small ballet company (volunteer…everyone loves you when you are free?) and would like to see if my headpieces/tiaras might appeal to some competition participants or small ballet companies. You actually helped me out a couple of years ago with a cracking problem on a mask I did for the Sleeping Beauty Ballet animal costumes. I will try to post a picture of how they turned out. Again, good luck to you with your new venture!! The fact that I am having trouble downloading the correct size photo is probably a good indication why I don’t have a website!! ?I will try the photo again. 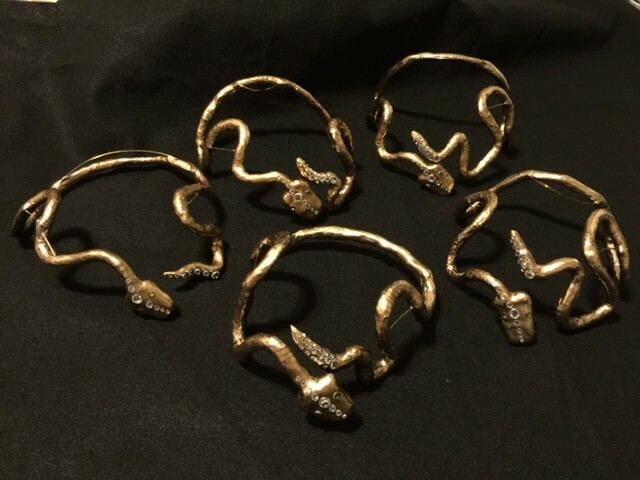 Here are some snake headpieces I made using your technique as well. They looked great on…Evil Minions of the Dark Forest. Dawnn, are the headpieces made with a wire inside paper mache? They’re unique, and beautiful, too. If you have any interest at all in writing a guest post showing us how you make them (and don’t mind giving away all your secrets), that would be really nice. I won’t nag, of course, but I sure would like to see how they’re made. Nice masks. Really nice – thanks for trying again to upload the photo. And you wouldn’t have to worry about the size of the photos if you made your own website. You would probably want to keep them reasonably small, just so the pages would load quickly, but you wouldn’t have to fight with my outdated software limitations. My new website is being built on Squarespace, and they really make it easy to create a professional-looking website. They also allow you to upload images of any size you want – they even encourage you to upload really big ones, but it doesn’t seem to slow anything down. I kind of wish I could move this site over to that platform, but it can’t be done. I remember the Sleeping Beauty mask. It was really nice. Just out of curiosity, have you done market research and come up with a price you think you’ll charge? You obviously put a lot of time and energy into each mask. If you do open and etsy store, be sure to come back and give us the link to it. I can share the snake headpiece secret…cotton cording (that you would use on pillows and other home furnishings) with wire threaded through the middle. I then rolled the end into a head shape and taped. After that it is all your method of paper mache and painting. Pretty easy but they do take time, which is why pricing can be such a difficult thing. Currently I just charge for materials since it is the non-profit ballet company my daughter dances in, but I can’t do that as a business. My next big mask project will be a Rat King head for the Nutcracker. Because sweat and moisture is an issue for a dancer wearing masks, I am going to combine your techniques with Organic Armor’s techniques using silicone and fabric and see if I can come up with a functional design. We’ll see! Thank you for your kind comments!! One more thing I wanted to mention. When I said that I might try selling my headpieces and tiaras as a business, they are primarily wire and jewel creations, not paper mache. The paper mache creations I have done were customized for the needs of the ballet company. I didn’t want you feeling like I was profiting from your techniques without giving you credit. I know paper mache has been around for a long time, but your techniques and recipes are awesome! No worries – I don’t mind at all if people use my techniques to make things they sell. Lots of people do. I like being able to contribute a bit to the artist economy. 🙂 But I do think you’ve got a good idea, selling the wire and jewel creations instead of your masks, unless you can make your masks a whole lot faster than I can. And we still want to see your etsy store if you decide to do that. Well, you certainly make it sound easy, anyway. 🙂 And the headpieces certainly are nice. If you find some new methods for your theater masks that can keep them from steaming up inside, I hope you’ll let us know. What I do to prevent too much steaming inside the mask is to make it above the nostrils so when they breathe out, it is not inside the mask. For the issue of sweat, I place sticky back Velcro (soft side) inside the mask where the mask touches the face. Then on the back of the other part of the Velcro (hook side?) I put moleskin. I then place the two Velcro pieces together, resulting in the soft moleskin against the dancer’s face. They then get the moleskin sweaty (and not the paper mache), and I can just discard the icky moleskin when the performance is done and put a fresh piece on for the next dancer to use the mask. I hope that makes sense! Excellent tip, Dawnn. I never would have thought of that. And yes, it makes perfect sense. many years ago I was making small wooden sculptures that I couldn’t sell for anything near the cost of production when I took my time into account. Then one customer asked if I could mount one on a stick… and, voila! My walking stick bussines was borne. People were more ready to pay for a sculpture on a stick than to stick a scupture on the wall. It is all about the niche. Charge what it cost to make, including your time, tell them it’s unique, offer to do commissions, and remember you can allways have a sale twice a year to clear old stock. Looking forward to you next video. Good advice, Alan. Do you still sell your walking sticks? Do you have a website? I only do commission now then I can quote a price up front and it becomes a take it or leave it situation. I am retired and I don’t have to buy cat food or pay the mortgage, so I have reverted to a hobby sculptor now. You may remember my snowman with the rabbits from last year, this is now in an exhibition that opens here in Lagos Portugal on 24 th April 17. it’s the first time I have exhibited anything but hopefuly someone will want to buy it, crearing some space for more work. Yes, I do remember the snowman! (It was the name I forgot – my brain is a sieve. Sorry…) Just in case some people didn’t see it, you can find Alan’s sculpture here. Good luck with the exhibit – I hope the sculpture sells for a ton of money. We have another reader from Portugal – I wonder if he’s going to be at the exhibit, too. That would be fun. Hi Jonni. I teach craft for a living and you would be surprised at how many schools and groups get in touch and say things like… The children would love you to come into school and work with us but we have no money in the budget… They think I will do it voluntarily? Ah yes – the requests for freebies. I think it’s fun to give things away for a good cause, but you can’t afford to do that if all the other people who use your services or your product aren’t paying you a living wage. The biggest problem with intentional poverty, which I’ve practiced most of my life, is that it reduces your ability to help other people and make a real difference in the world. On the other hand, one of the best things about intentional poverty is that you get to spend your time doing exactly what you want to do – unless you happen to like doing expensive things like travel and eating out. Have you tried putting your classes online? Even if you didn’t get paid for it, it’s still fun to do. Jonni, Just let me say at the outset that I’m an old man. I wish I had begun life with the idea that I could do what I LOVED to do and make a living at it. I don’t think there should be a division between hobby and business in an ideal world. When I first moved here, I made a piggy bank for the pharmacist. She asked “how much” and I gave it to her. She wrote a check out for $50. I found that interesting. When I did giraffes, a neighbor offered $200 for a large one. I think you could sell your sculptures for a great price. As you know, it will be exposure, exposure, exposure. People do not know about paper mache. I was watching a program the other day where an early paper mache sculptures of Donald Duck (and two others) sold for $32,000. Where I live, people would not pay much for a sculpture, as least in terms of how many hours it takes to make one and cost of materials, and time doing business. I see a lot of support on this site, and I think many would spread the word about your business on their social networks. I know I would. I think I have an odd reluctance, which is completely irrational, to put a price on something I make that I could never afford to pay. I know that’s totally unreasonable, because in uncertain economic times it’s the people who can afford the higher prices that you should be trying to sell things to. But that’s the way I feel, so I looked around for a product I could sell to me. Or to someone exactly like me. Sure, it might not be a good idea, but that’s what’s comfortable. Jonni, thanks for your brave and arduous work. I have the same problem as you. My work takes too long and costs too much to make a profit over and above my fair wage. It is frustrating for me as I have yet to find a niche that my art would attractive to the masses. I hope your new projects sell and you get a lot of joy in making them and you leave yourself time to work on the bigger works of art too. Have a glorious day! Creatively yours, Jenni “jenja” James. Gosh – the name question is way out of my level of expertise. I think you can call yourself anything you want to, but if you want to use the name as a business name, you’d need to research to make sure someone else wasn’t using it. There must be some attorneys online who have articles about it. You could always send an email to your collectors to let them know that your new work will be signed differently. Way back when I started making websites, 18 years ago, the marketing experts kept telling people that we shouldn’t try to appeal to everyone. We should try to find a small niche, and become the person people associate with that niche. That’s pretty much what I did when I built this blog. You’d be surprised how few adults there are in the world who think about making real sculptures with paper mache. But if they start looking for advice, they find this site. This site is just a hobby, but I think the same thing applies to any kind of business. If you can appeal to a specific group of people, and give that group what they need, you’ll do much better than trying to appeal to the masses. Do you have a link to your website, or a way that we can find your work? And when you say you’re published under that name, does that mean you have some books you’d like us to know about? What do you call a person who wants to respond to everything and has no idea how to do anything? I, of course, cannot give legal advice, but I did start a woodworking business in the 1970s. As I understand, if you use your name, you do not need to file a dba (doing business as), because it would be redundant to say “Rex” is doing business as “Rex”; however, if you are not doing business under your own name, you must file a dba with the city and the city business license stuff. My business was Winworks, and I did woodworking projects and interior design stuff under that name. Did you enjoy the business? If you had it to do over, would you do it again? The woodworking business didn’t last long, and neither did the Interior Design business. If I had it to do over again, I would go to college and learn how to do lithographs, etchings, silk-screening, airbrush, and find some nitch in the art field. I have a nephew who does silk-screening, and I would love to go to his shop, but he is far away. I also did drafting, watercoloring, wanting to help people write their biographies — it took me 20 years to get out of college classes! But I did not take seriously enough the difference between hobby and work; hence, my comments that I made before. As far as doing it again, I don’t have much business sense, and I’m not a salesperson in any way, which I think is crucial. Over the decades, I have seen awesome artists in classes, many types, and I wish someone would go into these classes, buy the art, and sell it. I think they could have a good business and help out artists. My two-cent’s. Rex, I think you’re quite right about the selling aspect – I don’t think art schools talk about that very much. I’ve seen people with average skills do really well in the art business, while people with remarkable skills might never find a buyer for their work. I watched a video today by a younger artist who says he started doing really well when he got married. His bride had hidden business skills that helped him do the things he just couldn’t do on his own. That’s a perfect solution – but rare. Most of us just have to slog along on our own. I really like the idea of someone coming in and collecting the work of student artists, but only if that person also taught them what to do next, once they’re on their own. Teaching them to fish, I suppose you could say. Maybe the benefactor could also hook up young artists (and old ones, too) with mentors who could guide them through the process at first, until they’re skilled enough to carry on by themselves. I know there are people who sell those services, but people just starting out can’t usually afford that kind of help. By the way, have you shown us your watercolors or any of your woodworking? Do you still have some of them that you’d be willing to show us? Jonni, the tamandua is so wonderful and right down my alley. Now, get your daughter to finish her tutorial on painting fur (and maybe how to make fur with paper mache clay). I am not familiar with them at all. I will definitely have to give up the pumpkin nonsense! I have a few wooden boxes I’ve made hanging around, and my table next to my bed has had 30 years of abuse. I remember the first time I saw a video of yours, I thought you were crazy working on such a tiny surface. Now I do all my projects sitting on the bed and use the table as a work space. I claim 12 square inches on the bed, and that is where Teca has to sit, of course. I’ll attach a few watercolors. You don’t have to display them all, of course. The watercolors are beautiful, Rex. I’m so glad you showed them to us. What a talented guy you are! Have you done any watercolors lately? That’s not an easy medium to master – I’ve never had luck with it myself), so I’m quite impressed. I’m looking at the one in Japan right now, and the values are perfect, the drafting is perfect. Are they framed and hanging on your wall? And don’t give up on the pumpkin nonsense entirely. We have so much fun seeing them. And I’m sure Teca enjoys helping, too. Another one. 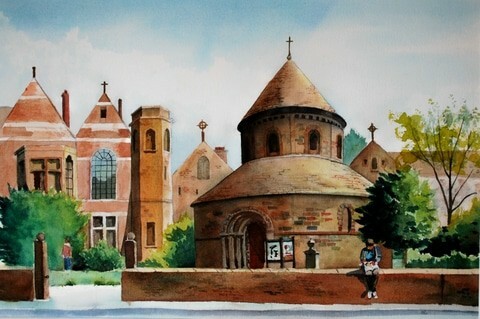 This one is Cambridge. The other one is Japan, of course. 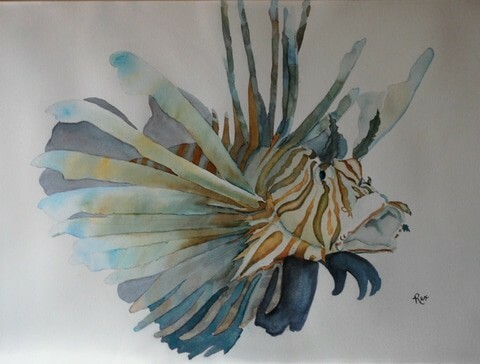 And a lion fish. Oh, my! That is too many. I haven’t painted a watercolor in a few years (paper mache kind of took over). I have been doing a few sketches (since Loki died) and even went so far as to find the watercolor paper, but nothing yet. Thanks for your comment. I have a much easier time going from light to dark than I do from dark to light — that is one of the reasons acrylics and oils are such a challenge to me. And just to prove I love birds. Rex, I just saw your magnificent watercolors! They are incredible, especially the oriental one. My you are quite the talent…sculpting, painting, woodworking, writing…. the list goes on. Thanks for sharing. Hi Jenni, if you do change your name for lets say business purposes like printing or for an identity you could add “doing business as: jenja. It is your persona as an artist and you can use your real name in doing business transactions. In my flickr site I am photogirl7.1. I put my photos in the creative common license with attribution. I can say many of my photos have been used in many websites. I thought of getting into the photography business but it is a very hard and highly competitive field that it looked very daunting. But at least I can say I am published. If I am to make money in the medium it is going to be in the form of a book in photography in areas that I am good at. This is just me. Lots of sites that use my photos use my name Christine Majul in attribution or photogirl7.1. I have admired your paper mache art for a long, long time, so perhaps now would be a good time to check in to say hi — and after reading your post about experimenting with selling art online — share this link with everyone: https://theabundantartist.com. I am in no way affiliated with The Abundant Artist, but I’ve always enjoyed the information I’ve gained from the site. Also, it’s stated mission is “not only about teaching talented artists to sell their art online, but about dispelling the starving artist myth.” Perhaps it will be of interest, for I so agree with you about the difference between doing something for ‘earned’ income or for the greater sense of ‘psychic’ income that comes with doing something for its own sake, and the fun of simply doing it. Thanks for sharing that link, Christine. I’ve been reading Cory’s site off an on for a long time, and he comes up with some really useful ideas. Another person I’m following now is Dave Conrey. He has a book about selling art online, but I haven’t read it yet. I do enjoy watching his videos, though, mostly because he seems to be having so much fun making them. I don’t understand why he doesn’t have more followers. I certainly agree that we have to get over the idea that artists shouldn’t be able to make a good living. It might take a bit of work, and we might have to learn a few new things, but it should be possible, if you have a product that people want to buy. Thank you for the Dave Conrey lead, Jonni. Will definitely look into his book and videos. Appreciate knowing about this, and that you like his material. I am with Eileen in my admiration of your industriousness, Jonni, and wish you much success in your endeavor! 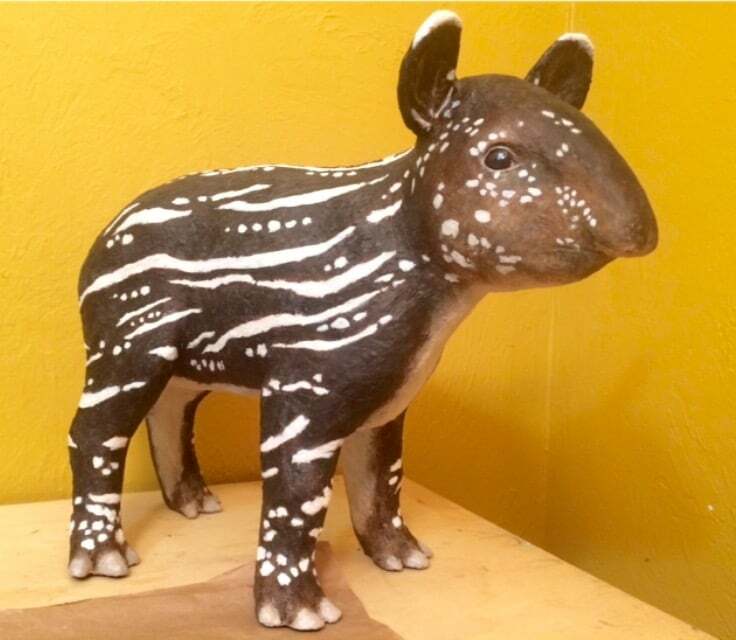 I haven’t attempted to sell my sculptures since I offered my Tapir for sale on etsy (for around $225, I believe it was). It didn’t sell, and I was even asked by someone who was interested in it if I’d be willing to lower the price (!) because their shipping cost was to be so high. Today I feel glad that she didn’t sell, because she adorns my living room and I appreciate seeing her every day. I’m very much looking forward to your daughter’s fur-painting tutorial! Suzanne, you must have posted your tapir on line. I’m especially curious because I would like to make one. Jonni, do you know the link. Suzanne, did you have its mouth open? Sorry Rex, the search thingy didn’t come up with “tapir” when I tried it. Suzanne, even if you shared it already, could you show it to us again? Pretty please?? Hi Rex, My tapir’s mouth is closed. Are you planning to make one with an open mouth? I watched footage of Tapir calves before beginning the sculpting process and found them to be such interesting and adorable little creatures. He is adorable! The stripes, the feet, the funny nose – and you caught them all perfectly. Oh, Susanne, now I remember. I loved it then and love it now. I don’t know about the open mouth — hopefully it was just a moment of wonder. After seeing this, I think I like the closed mouth. Just awesome. Thanks so much for reposting this baby. That’s my other problem with business. Few would pay what I think they are worth, and I think this ought to be $500-$600. I get a little shocked when people don’t want “hand-made” things. I enjoyed your latest video and appreciate how much time you put into the research. Unfortunately, you have discovered what most artists in one field or another have found out. Unless you put an inordinate amount of your own money in to get started, it is still very iffy if a person can ever get it off the ground and profitable without totally burning yourself out. I have been an artist all my life and even had a stained glass studio in a shopping center along with many many other things and only once in a while was able to pay my costs for housing the business and buying materials. That said, you name it and I have done it. At almost 76 years old, I am burned out on almost everything, some of my endeavors lasting over 20 years, but even thought I made a little money with some of them, it was never enough. The burn out thing with artists is very real and can completely wear you out for trying. That said, I am still looking for that “magic” but I think I have become too jaded to continue on except for my own pleasure. I hope your new project will boost you to the top, I tried nearly everything and was at the top of my field at different points in my life but as I sit here writing to you, at least I can say that I was able to excel over my peers many times, but only reached the pinnacle and made a profit twice when I was young enough to have the years and desire to do it. Hope I didn’t rain on your parade, just be careful not to exhaust yourself in the process. I send my best wishes for you. The image is a combo of my watercolor combined with digital manipulation, my latest endeavor. Hi Gina. You’re so right about the burn-out issue. I think a lot of small businesses have the same problem, where there’s just one person doing all the work. That’s why I’m trying to figure out how it can be done without taking all the fun out of life. I don’t do stress – I avoid it like the plague. So if I continue, it will be with something that can work without me being a slave to it. The image you tried to upload didn’t come through. I’d love to see it. Can you edit the photo to make it smaller, and try again? Wondering when you’d get around to going “PRO” and quit giving it away. Most Art pundits agree that 50% of your time should be spent peddling the stuff you’ve made. Seems steep, it isn’t and it is the Golden Rule of Art. If you don’t think galleries are for you (they do take 50% of your gross) they give you back a lot of time to make more stuff. They advertise, they are there 7/24 if they have a website, you don’t have to own a tent or stand under it when it rains. If a gallery will work for less than 50%, forget them. Those who offer larger discounts to artist need artists, more than you need them. How big is your Mailing List. I sent out near 300 emails showing some new work a month ago and got four new (the good, 50% type) galleries and got invited to a major regional exhibition. Doesn’t matter if you want to sell through galleries or out from under an umbrella. Without a mailing list you have no audience. If you want to sell out of your automobile’s trunk, don’t use galleries within 100 miles. Selling around galleries, who are perhaps giving your work much needed sizzle, is marketing suicide. You will get caught, your work will quickly be found at the curb in front of the offended gallery. Be honest, be fair, have a great time. All good points Jim. But no, I’m the independent sort, and don’t want to work with galleries. It’s a great way to go, but I think I’ll stick to an online business exclusively. I understand website (usually), so I’ll stick with it. Congratulations on the great response to your mailing! That’s fantastic. From my myopic view, using galleries is more efficient. Because clay has to dry before getting bisque fired, I use that time and dedicate it to the care, feeding, maintence of the development of a critical mass of galleries. For your type of work, I agree that galleries are the best way to go. You want your buyers to see them in the round, touch them if they just can’t stop themselves, etc. It helps them feel connected to the work. If I intended to sell my sculptures, I’d do the galleries. Or I’d at least give it a try. But, like I said, I’m just too danged slow. It just doesn’t work for me. Hi Jonni – I have been quietly watching you work for some time now… in awe, I might add. I’m just wondering if you have considered selling video tutorials (either for instant download or on DVD that folks can receive in the mail)… or perhaps writing project tutorial books to sell. There are all sorts of was of publishing these without going through the usual ‘publisher’ nonsense. This still leaves you the ability to sell your work as well without having your work to carry the burden of the business. Your videos are excellent and very detailed which to my mind is worth a fortune. If you take a look at say – Teddy Bear makers for example. There are millions of people out there making artist bears but as you well know – you can’t make enough of them fast enough to make enough money to pay yourself and you end up feeling like you are giving them away. A good many of them now sell patterns, tutorials, booklets, etc… to instruct others on how to make their bears. Add to that, on line courses that people pay to take and local (or distant if you like traveling) workshops as well. Just something to consider. Your work is valuable but don’t forget there is value in how you do the work as well. You give so much away through your web site and maybe it’s time to restructure that so that you can finally enjoy a little payback. This also leaves you with more time to create new things which is what it’s all about – no? Hi Eileen. I have thought about doing the videos, maybe on Udemy or Teachable.com. I think it would be a lot of fun, actually. I do have several books available, (see them in the sidebar) and they’re self-published. I’m happy to say that Dan Reeder and I have the top-selling books for adults who want to sculpt with paper mache. But I’ve decided that I want to find out if I can sell artwork instead of information about how someone can make their own art. I think there’s a lot of people who would like to do it, too, so it might be a fun project for people to watch. And I’m happy to say that the patterns are now helping to pay for the site. It’s a lot more expensive to run a blog like this than people imagine, but the few sales I’m making from the patterns is now covering the costs. My daughter insisted that I had to stop giving it all away, and I finally decided to listen to her. I’m glad I did. Jonni – I’m so glad to see you post this! Yes, artists deserve to be paid, and deserve to make a living. In order to do that, they have to learn marketing, sales, and lots of business-y stuff that most don’t want to learn. But if you want to be well-paid for your work, I think you MUST do that. So it’s simple – you decide to run a business, and you learn business so you can be paid for your art… or it’s a lifelong hobby. Either is OK, it’s should be a choice. But no one is ‘trapped’ into it being a hobby if you don’t want to learn the business. I acknowledge and appreciate you for saying ‘This is a business and I want to be paid.’ Please feel free to charge for your wonderful tutorials or blogs. I’ve got my wallet out, happily. What you do is worth it! Hi Pamela. I agree – there’s nothing wrong with a hobby, and it’s great when a hobby pays for itself. The hard part for me was simply allowing myself to see a difference between a hobby and a business. But I’m glad I’m heading in that direction, because putting all the pieces together is actually fun. All the stuff I never wanted to do is, I’m learning, the parts that allow it all to work, and that lower the stress, help you make better decisions, and all the rest. Besides, it’s something new to learn, and we have to keep our brains working on new things, right? Jonni, for your readers in general, I want to echo what Pamela says in her post. The majority of my life’s work has been as a freelance designer and writer. But it wasn’t until a magazine hired me to interview successful artists and craftspeople that I really understood the importance of managing my freelance work as a business. Like many highly creative people I equated the words “managing a business” with “totally boring and uncreative”. But as I interviewed successful artists and craftspeople, I heard the same story over and over. They ALL said the same thing–I never really made money until I started managing my business like it really was a business!” And more than that–they all said that once they started managing their work like a business, they quickly found out that they could invest just as much creativity in running their business as they invested in their painting or sculpting or craft work. One woman I interviewed was an extremely accomplished portrait artist working in pencil. At the age of 30, she decided she was burned out with winning lots of awards but living on ramen noodles. She returned to college to earn a Masters in Business. The year after she graduated, she grossed $100,000 and paid off her entire student loan. The next year she grossed 1 million dollars. She told me the keys to success were targeting a niche market and putting as much or more time into marketing as you do into your art or craft. An oil painter specializing in Civil War battle scenes told me the same thing. Although a very gifted painter, he was just scraping by selling at art fairs until a man who saw his work asked if he could paint a Civil War scene. The client was delighted with the finished painting and said he couldn’t wait to show it off to his fellow Civil War Reenacters. 5 members of that group quickly commissioned their own paintings of battle scenes. The artist told me “That’s when I really started to understand the power of choosing a niche market to focus on. Before that happened, I always thought choosing a niche market meant having to narrow yourself and be less creative. 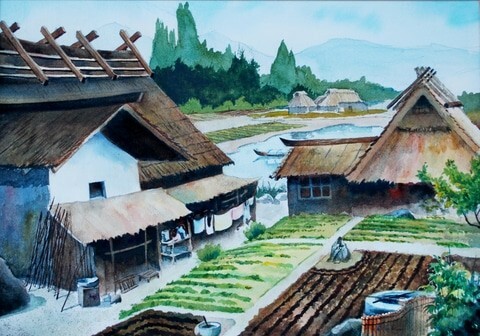 But in fact it widened my world.” In addition to taking commissions for original paintings, he also licenses his paintings as prints. He told me he spends 1/3rd of each year–the winter part–painting. He spends the rest of the year marketing; attending reenactments, attending art shows held very near to famous battle grounds, and placing both ads and articles in magazines focused on the Civil War. And he makes a VERY good living. As I learned from the successful artists and craftspeople I interviewed and began to incorporate their advice into my own life, both my income and my opportunities grew. The more I studied marketing, the more its power fascinated me. It really is a field where being as creative as you can be pays off, both in terms of income and in terms of deeply satisfying work. Eventually I became so wrapped up in the creative aspects of managing a business that I stopped almost all other creative work to become a consultant teaching internet marketing. I soon learned that focusing on self-employed professionals, especially consultants, could provide me with a steady stream of very lucrative clients. Now, at age 67, I am looking to downsize the amount of time I spend working, so I am once again retargeting my business. My focus now is teaching creative people to market, and hoping to open eyes to just how lucrative and creative managing a business really can be. True to what I learned long ago from all those interviews I conducted, my very first work was creating a business plan and I’m now in the midst of setting up my marketing, all well in advance of creating any products. After a lifetime of lessons learned, I can now confidently state that success as an artist or craftsperson boils down to 5 steps: 1) Develop your creative skills 2) Choose a niche target 3) Market 4) Market 5) Market . In running a business, any business, there’s a great deal that needs to be done. Too may creative people read advice about how to run a business and then stall out before they every get started. They are too intimidated by all there is to do. The best way to start is by taking one small step, doing one small thing, every single day. If you’re just starting out, I suggest this as your first step: Look around and make a list of ALL the things you are capable of doing. The next day, take this small step: make a another list–hopefully a very long list–of all the types of people that might want to pay for one of the things you are capable of doing The next day, take this small step: Start to narrow in on a niche you could target by drilling down. Everyone has numerous categories they can succeed in, so drill down in as many categories as you can think of. Here’s some examples of drilling down. Lets say you are equally skilled in photography and illustration. Lets say you also love animals. One of the largest niche markets in the United States is in the pet field. A lot of people want photographs of their pets. You could photograph pets, and as an additional service, you could paint pet portraits from the photos you take. A woman I know does just this and her primary means of marketing s by offering to decorate veterinary offices with her work in exchange for hanging a notice that she is the artist and is available to photograph and also paint pets of all kinds. As another example of drilling down, lets say you are equally skilled in photography and illustration. Lets say you also love to ski, and you love to travel. You could ski at slopes all around the country or even all around the world and photograph the ski trails. You could then create illustrated maps of those ski trails based on your photographs. And you could sell those illustrated maps to avid skiers. Last week I read about a woman who does just that. She has found a small but very lucrative market of people that want to celebrate the ski trails they’ve conquered by hanging these maps on their walls. This artist has learned the art of drilling down to find a target market. And she did it all by taking one small step every single day. There’s not a single reason you can’t take one small step this very day. And another small step tomorrow. Hi Bee Bee. Thanks for the thoughtful post – you gave us some excellent advice. And I hope you have great success with your latest adventure. Jonni- Wow, you have certainly brought up quite a few points and they are valid. I admire how much research that you have done to come up with your conclusions. I guess it all comes down to how much of a “business” do you really want. I take from your video that you are truly looking for a business, not just a hobby that may pay out a bit. I am curious to see what you have come up with. What an industrious beaver you are! There are tons of artists that have made their work into a profitable business by licensing their artwork, putting it onto greeting cards, mugs, tote bags and the like. That doesn’t work with a 3-D artwork though unless you make molds or something. There is so much competition out there for cheap sculptures that it would be hard to keep up and may not be worth it in a business sense unless a company would employ you to do it. I think it is too hard to do the promoting and business aspects of selling your artwork, it does require a real commitment on your part. I am curious to hear what you have come up with and I do pray everything falls smoothly into place as you attack this endeavor! I do look forward to Jessie’s fur painting tutorial. It is bound to be good and extremely helpful as she is so talented. How kind it was for her to do that! So even if I thought it would be OK to have another hobby, and I decided that I didn’t care how little I made an hour, it could take all the fun out of making paper mache sculptures. That seems like a heavy price to pay. Jessie is trying to figure out how to edit several hours of video into a short YouTube tutorial. Believe me, it isn’t easy, but I can’t wait to see it.